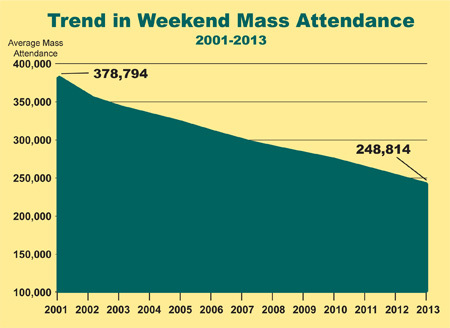 Every year about this time the Archdiocese of Philadelphia releases figures for weekend Mass attendance during October of the previous year. That month is deliberately chosen because it is a period when few people are away on vacation, weather is usually not intemperate and there are no major feasts to skew the figures. The latest release, covering October 2013, has bad news and good news. The bad news is that, for the umpteenth time, attendance is down from the previous year. The good news is that the 2013 decline was much less than those of other recent years. The decline in Mass attendance in October 2010 from the previous year was 8,637. In 2011 it was 9,782 and the following year it was 9,488. This most recent year, 2013, the decline was 4,524 from the previous year. While there is no data to absolutely prove cause and effect, it is noteworthy that 2011, the year of the deepest decline, was also the year of the disheartening second Philadelphia Grand Jury report on sexually abusive priests. Perhaps it is too much to hope, but could this recent more moderate decline indicate an increase in the morale of the faithful? What is interesting is that not one of the four episcopal regions stood out as an area of either strong growth or rapid decline. Episcopal Region I (Delaware and Chester Counties) had 82,622 Mass-goers, down 1,602. Episcopal Region II (Montgomery County and parts of North Philadelphia) had 58,812 Mass goers, down 301. Episcopal Region III (various section of Philadelphia) had 21,630 at Mass, down 355. Episcopal Region IV (Northeast Philadelphia and sections of Bucks County) had 88,016, down 2,286. Among the deaneries that make up the episcopal regions, two showed an increase: Deanery 5 in Montgomery County, up 495; and Deanery 8 in South Philadelphia, up 373. All told, 12 of the 24 parishes in Deanery 8 last year had increases, led by St. Thomas Aquinas where Mass attendance increased 366 to 1,300. Generally speaking, parishes that showed an increase were those that absorbed other parishes through mergers because it reflects the figures of both. There were exceptions among non-merged parishes, in addition to St. Thomas Aquinas. Among them were St. Patrick in Norristown, which has a strong Hispanic ministry and which showed a gain of 556 in Mass attendance with five Masses, of which three are in Spanish; and St. William in Northeast Philadelphia, which gained 424 with five Masses including Masses in Spanish, Creole and Pakistani-Urdu. The pattern for growth in Mass attendance seems to be parishes that are maintaining their population but are also reaching out to newcomers of other ethnicities. “It’s a lot of people working very hard to make things happen,” said Msgr. Hugh Shields, pastor of St. Thomas. Mass is only one part of the ministry, and although Mass is celebrated in various languages, through this many of the people attracted to the parish might also attend the English-language Masses and participate in the social services offered by the parish. While Spanish-language Masses are by far the most in demand because of so many Latino immigrants, other non-English Masses might be celebrated in a single parish with people coming from all over. At St. Martin of Tours in Philadelphia, there is Spanish ministry but also a Portuguese Mass for Brazilian immigrants. “We get about 150 every Sunday and sometimes a little more. We are happy to have the Mass here,” said Deacon Joao Ferreira, who oversees the ministry. “We have a larger celebration around May 13 and Oct. 13 for Our Lady of Fatima.” As with other language groups, “most of our young people go to American (English) Masses,” he said. One thing that is crystal clear from the statistics. In cases of parish mergers, one plus one very often comes up considerably short of two, at least in Mass attendance. This was the case in the 2013 parish mergers in the archdiocese, when comparing individual parish numbers of 2012 with the combined numbers shown in the 2013 October counts. • In 2012 Philadelphia’s Holy Innocents Parish had 1,246 attending; St. Joachim 190; St. Joan of Arc had 223 attending and Mater Dolorosa 167. The following year with all merged at Holy Innocents, the 1,592 Mass-goers shown in the October count represented an overall loss of 234 for the year. • St. Laurence in Upper Darby had 1,106 attending and St. Alice, Upper Darby, 822 attending in 2012. After the merger at St. Laurence, which had 1,631 in the 2013 October count, the parish showed a loss of 297 for the year. • Philadelphia’s St. Athanasius had 296 attending and St. Benedict 177 in 2012. Last year’s October count showed 427 at St. Athanasius after the merger, a loss of 54 for the year. • Philadelphia’s St. Barbara, 133 and St. Rose of Lima, 143, merged at St. Barbara which had a 198 October count, a loss of 78 for the year. • St. John Fisher in Boothwyn, 699 attending; Holy Saviour in Linwood, 478 attending and Immaculate Conception, Marcus Hook, with 385 attending in 2012 merged at St. John Fisher which had a 984 October count, a loss of 578 for the year. • Blessed Virgin Mary, Darby, 392 attending and St. Louis, Yeadon, 140 attending merged at Blessed Virgin Mary which had a 507 October count, a loss of 25 for the year. • St. Philomena, Lansdowne, 417 attending and St. Cyril of Alexandria, East Lansdowne, 257 attending merged at St. Philomena which had a 663 October count, a loss of 11 for the year. • St. John Cantius, Philadelphia, 564 and All Saints, Philadelphia, 288 merged at St. John Cantius which had a 622 October count, a loss of 230 in 2013. • St. Leo, Philadelphia, 441 attending and Our Lady of Consolation, Philadelphia, 359 attending merged at Our Lady of Consolation which had a 699 October count, a loss of 101 for the year. • Philadelphia’s St. Callistus, 110 attending and Our Lady of Lourdes, 390 attending, merged at Our Lady of Lourdes, which had a 493 October count, a loss of 7. • Philadelphia’s Our Mother of Sorrows, 99 attending and St. Ignatius, 133 attending merged at St. Ignatius, which had an October count of 227, a loss of five. • Philadelphia’s Our Lady of the Blessed Sacrament, 276 attending and St. Cyprian, 665 attending merged at St. Cyprian, which had an October Count of 690, a loss of 251. • In a more complex situation in Philadelphia, Incarnation of Our Lord, 632 attending, merged in a split into St. Helena with its 1,026 attending but also some Incarnation parishioners going to St. Veronica with its 517 attending. St. Hugh of Cluny, 532 attending, also merged into St. Veronica at St. Veronica. The two surviving parishes, St. Veronica and St. Helena, had 1,018 and 1,211 October counts respectively for a net loss of 185 from the five former parishes. In all of these cases of drops in Mass attendance at the combined parishes compared to the separate parishes, the question is, what happened to the people who left? Part of it may have been a natural decline that would have happened anyway. Some people may have opted to attend a different parish than that to which they were assigned, others may have died or moved away, some may have already moved but were still attending their old parish church, and still others may have simply stopped going to church. Further examination of the October Count shows in most cases of merged parishes, surrounding parishes in the Pastoral Planning Area (PPA) generally do not show gains sufficient to offset the shortfall of the affected parishes. As a matter of fact, among the 44 PPAs in the archdiocese the seven PPAs listed as having merged parishes in the 2013 October Count lost a total of 2,361 Mass attending Catholics, more than half of the total drop for the entire archdiocese. While many dioceses around the country faced with declining Mass attendance and clergy shortages have had to consolidate parishes, no study has been done to determine how mergers themselves affect parish participation. We do see from this microcosm of the Church of Philadelphia that overall Mass attendance between October 2012 and October 2013 declined slightly under two percent. However, in parishes affected by mergers, both sending and receiving, the decline for the reconfigured parish was on average 15 percent. Hopefully the missing 13 percent are simply attending another parish church and are yet to be counted. I hope the Church in the U.S. will someday take seriously that the best way to increase Mass attendance–not to mention things like increase vocations to the priesthood and religious life–is to support and nourish people in the context of their most basic human interests and concerns, e.g. family relationships, work, etc. For starters, parishes must nourish and support the domestic churches that make up the parish; then domestic churches will participate in and support their parishes. Close more parishes and watch the increased decline in church attendance. Many feel that in a world that is unfeeling and distant, the parish to which they belonged to (perhaps since since their early years) has now also been taken from them by a distant and unfeeling church hierarchy. Many elderly parishioners who previously walked to their parish church now find themselves unable to get to the “new” parish church, which is further from their home, due to the fact that they may not have a car. Did anyone at 222 South 18th Street consider this? Mass attendance is one, and perhaps the most important, metric for measuring Church “success.” But, this begs a question, “Which metrics measure the Church’s success? Unfortunately, success in America is defined by numbers–larger are better! Does the Holy Spirit measure? The 13 percent aren’t missing they are disillusioned with the Catholic church. i.e. parish mergers,clergy molestation,ect. I find it hard to believe that ANY decline can be considered “good news”. What would the raw data comparison be with say, the 1960s versus 2001 ?? ?